In the span of just over six months, the Harvard Kennedy School lost three prominent African-American women leaders. The departures came amid increasing scrutiny of diversity at the school. UPDATED: April 3, 2018 at 11:59 p.m. This article is the second in a two-part series on diversity at the Harvard Kennedy School. Read the first installment here. First, it was Institute of Politics Director Maggie A. Williams, who announced last April she would leave the role she had held for three years. Next came Karen Y. Jackson-Weaver, who stepped down from her post as the Kennedy School’s dean of students last spring. And in November, after publicly declaring she did not feel supported at the Kennedy School, Alexandra Martinez—then the assistant dean for the diversity and inclusion office—followed suit. In the span of just over six months, the Harvard Kennedy School lost three prominent African-American women leaders. The departures came amid increasing scrutiny of diversity at the school, which has faced internal criticism for its lack of minority students, faculty, and staff. Though the reasons for the women's departures varied, Lauren R. Powell, a 2017 master’s in public administration graduate of the Kennedy School, said she finds it “alarming” that these women all decided to leave at around the same time. The Kennedy School has been working for years to diversify and to address concerns shared by minority affiliates at the school. The school established its Office for Student Diversity and Inclusion in 2012, and Kennedy School Dean Douglas W. Elmendorf convened a task force on diversity and inclusion in 2016. In May 2017, that group released a draft report outlining demographic statistics and proposing a number of measures to promote minority faculty recruitment and curricular offerings that appeal to students from a range of backgrounds. Students and faculty say the dearth of minority faculty and administrators at the school leaves students of color lacking role models and feeling uncomfortable discussing race in the classroom. The recent departures of prominent female African-American administrators, many say, has not helped. Jackson-Weaver, who students and faculty describe as very active and interested in student life, left the school abruptly last May, surprising and confusing some students. “I had no complaints whatsoever about her,” Parker said. “I thought she was very widely admired by the students, and I was rather surprised when she left." Jackson-Weaver did not respond to requests for comment. Williams left the Institute of Politics in April 2017, citing her long commute and asserting she had achieved her primary goals. Her tenure as director was marked by controversy; some critics said Williams's role on the Clinton campaign comprised a breach of the IOP’s commitment to nonpartisanship. At one point, several alumni and students called for Williams’ resignation. Former IOP President Jesse I. Shelburne ’18 said at the time Williams's resignation was not connected to these events. Martinez, on the other hand, made clear at a meeting of the school’s student-run diversity committee, a week before she left, that her decision to leave the Kennedy School directly stemmed from the “lack of support” she received from other school leaders. Elmendorf declined to comment on Martinez’s departure and on criticisms of the school. The departures of several high-profile women of color at the school made waves within the diversity task force itself, causing at least one task force member to become disillusioned about the prospects for change and to ultimately step down from the body. Kennedy School lecturer Timothy P. McCarthy ’93 chaired the “Campus Life and Culture” committee of the task force until he left the group last spring. He attributed the decision to his belief that the school has “a diversity, inclusion, belonging, equity, and justice problem” which manifested itself in the departures of these African-American female administrators, specifically Jackson-Weaver. Students and faculty members said that, regardless of the reasoning behind these departures, the women's exits exacerbated the longstanding dearth of people of color and women professors and top administrators at the school. According to the diversity task force’s report, the school employed five African-American faculty members in 2017, two of whom were tenured professors. African-American representation on the staff level has remained “stagnant” over time—in 2005, African Americans comprised 6.1 percent of Kennedy School staff; by 2015, that number rose to just 6.6 percent. Latinx faculty members in the U.S. made up 2 percent of the faculty in 2016. In the 2017 academic year, only two faculty members classified in the report as “Hispanic” taught at the school, both as full professors. By contrast, across the University as a whole, 18 percent of faculty and 22 percent of staff come from underrepresented minority groups, according to the final report of a University-wide task force on inclusion and belonging released last week. Without adequate minority representation in the Kennedy School’s classrooms and offices, “we have insufficient faculty role models for our students,” the HKS task force report reads. Shaniqua L. McClendon, a second-year master’s of public policy student and president of the Black Student Union, said the departures of prominent African-American women left her and other students of color with fewer advisers and role models who can empathize with their personal experiences. Apart from its impact on mentorship, some students said the absence of faculty of color also impacts the curricula and discussions that take place in Kennedy School classrooms. Meredith Davis Tavera, the co-president for the Latinx Caucus, said this is especially true for Latinx students on campus. “One of the things that we see missing the most is actually just people who are working on issues that affect Latinx communities and policies that affect Latinx communities disproportionately, and who are looking at it from the perspective of how they affect our communities,” Davis Tavera said. Davis Tavera could only name one of the two Latinx professors at the Kennedy School–George J. Borjas, a professor of economics and immigration policy, who has written extensively about the negative impacts of immigration on the American economy and workers. Borjas did not respond to requests for comment. Khalil G. Muhammad, one of the two African-American tenured professors at the school, said the lack of minority faculty is “striking” to students of color and leads to gaps in understanding between students and professors. “There is a lack of literacy, a lack of fluency, and when tough questions are being raised, they tend to be pushed outside of the classroom for fear of alienating some students or making people feel uncomfortable,” Muhammad said. Laura E. Merryfield, a master’s in public policy student at HKS, said professors—especially those who teach “more analytical” courses—are not necessarily inclined to integrate themes of diversity and inclusion into their lessons. Muhammad also said, as one of the only black faculty members studying and teaching about racism and civil rights, he experiences a heightened level of responsibility to mentor students actively researching these areas. “There are few people at the Kennedy School who are prepared to answer those questions [about race], so where my experience differs to that is I have to be ready to take on a lot of additional questions and curiosities and research projects and all sorts of things that are perfectly valid because there are so few people at the school who explicitly care and show concern and have expertise in those areas,” Muhammad said. Powell said that, in her two years at the Kennedy School, she actively sought out courses taught by African-American professors because she felt their classrooms—unlike many other spaces at the school—were places she could talk about race. “So many of these courses talk about race indirectly, and we try to water it down with terms like people of color, underserved communities,” Powell said. Muhammad said he believes the curriculum should place greater emphasis on historical analysis and applying historical models related to race and racism in lessons about politics and policy-making. “You can't entirely solve the problem just by putting in black or brown or native scholars; you'll also have to bring in faculty whose enterprise is precisely in these areas,” Muhammad said. “You need more faculty that represents the world as it actually is, but you also need some of that representation to be scholars who speak directly to race and racism as it has played out for centuries in the U.S. and elsewhere." The task force report bluntly acknowledged the “underrepresentation” of “U.S. historically underrepresented minorities” among the faculty and proposed a number of recruitment measures to address the problem. “While it is true that the Ph.D. pipelines from which we hire the vast majority of our faculty are not as diverse as the U.S. population as a whole and that the faculty hiring process and turnover is much slower than for staff, it is essential that we have a diversity of perspectives on policy issues at HKS,” the report reads. “Over the past 10 years, despite efforts to diversify the HKS faculty, we have not made as much progress as we’d have liked,” the report continues. The task force identified implicit bias as a probable culprit. “While we think we have the very best faculty in the world, to the extent that there is implicit bias in our search processes, we may miss truly top-notch faculty altogether,” its report reads. The report recommended initiatives to promote minority recruitment within the four steps of the faculty hiring process, including creating “a bridge” to tenure-track positions through a postdoctoral program, providing search committees with guidelines to solicit nominations from “women and minority scholars,” and conducting a “blind reading of applications” without names or Ph.D. programs visible. Another recommendation called on search committees to provide an explanation for removing minority candidates from shortlists before they receive an invitation to visit campus. A document provided by Kennedy School spokesperson Doug Gavel listed progress on several of the task force’s recommendations. Suzanne J. Cooper, academic dean for teaching and curriculum, “revised the guidance” on hiring to include additional material on bias when faculty search committees read applications, according to the document. “We are providing the revised guidance to each search, promotion, or review committee as it begins work, and we will distribute the guidance to all faculty members when they consider and vote on hires, promotions, and reviews,” the document reads. 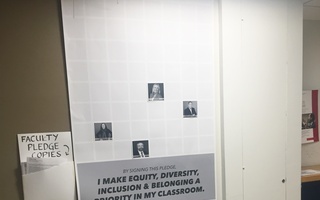 Students from various affinity groups at the school are continuing to urge the school to recruit diverse faculty and administrators. Bryan Cortes, a first-year M.P.P. student and member of the Latinx Caucus, said the caucus focused on pushing for more diverse faculty members and fellows at the school’s various centers, including the Shorenstein Center and the Institute of Politics. “I know for example the Shorenstein Center next semester—I can't reveal the name—but I know they're going to have a fellow focused on Latino and Hispanic media so it's encouraging to see those stats going forward,” Cortes said. The Kennedy School also announced a new fellowship in March aimed at students with a “strong commitment” to Latinx issues in honor of the late Lisa M. Quiroz ’83. The fellowship, housed at the Center for Public Leadership, will provide funding for students who have demonstrated an interest in reducing disparities in U.S. Latinx and other underserved communities. 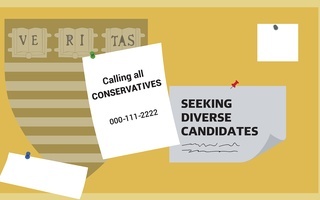 Davis said it is easier for students to push the school to appoint Latinx fellows—whom she called “low-hanging fruit”—because of the slow process of hiring new faculty and senior administration officials. The school recently hired Robbin Chapman as its new associate dean of diversity and inclusion in January. She will assume that role this month. 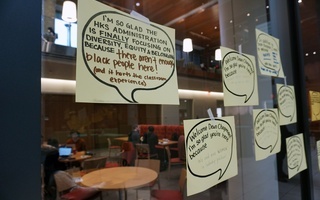 The Black Student Union has also contributed to the faculty hiring discussion, recommending in a written response to the diversity task force report that the school examine the faculty hiring process “for any implicit bias.” The student group also urged the school to recognize and compensate the “unseen work” undertaken by faculty of color. According to Elmendorf, the Kennedy School has already begun to make strides in recruiting more people of color for faculty and top administrative roles. He specifically pointed to Chapman, the school’s new associate dean for diversity, inclusion, and belonging, as well as a new communications director and chief financial officer—all of whom are women of color. McCarthy said he believes the dean appointment represents a “turn in the right direction” towards a more substantial commitment to issues of diversity and representation and that he admired Elmendorf’s willingness to listen and “take the heat.” Still, he said there is much more to be done. “I always have hope for the future, until proven otherwise,” he added. 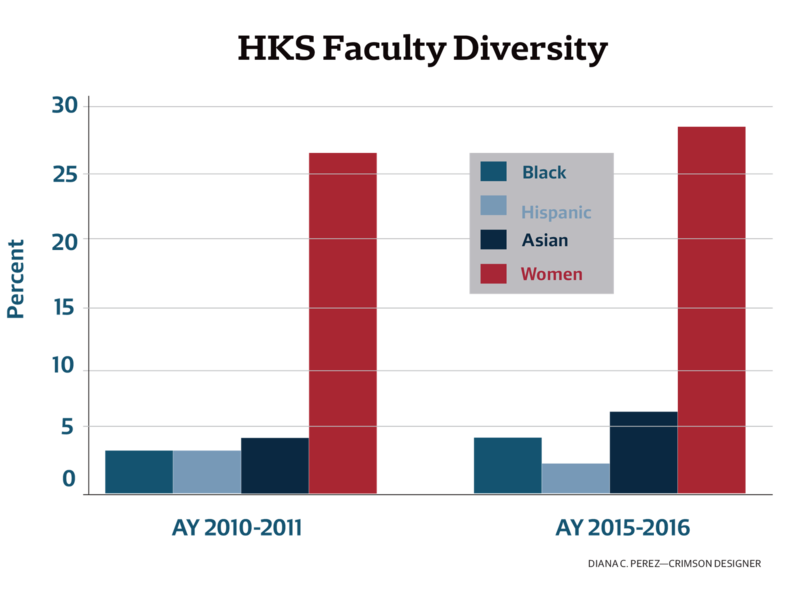 Due to an editing error, a graphic previously accompanying this article incorrectly confused the percentage of Kennedy School faculty and staff between academic years 2010-2011 and 2015-2016 that were Asian with the percentage that were female. This article has been updated with a graphic displaying the correct figures. For a school that focuses on governing, having a student body that represents the national populace is absolutely essential toward achieving its core purpose.